So here’s the thing. When you’re travelling Europe and it’s hot, we tend to head towards the coast to cool off and drink in the amazing views that inevitably the sea gifts. As romantic and lovely as it sounds though, that strategy brings with it some challenges, namely salt and sand. Sand I guess we can live with – get the hoover out and bosh, it’s gone. The salt is a bit more tricky, as it’s a silent enemy that plays mischievously with your van and implements. For a few days or so, that’s no major issue, although over a prolonged period, it could be more troublesome, as we found out this week. 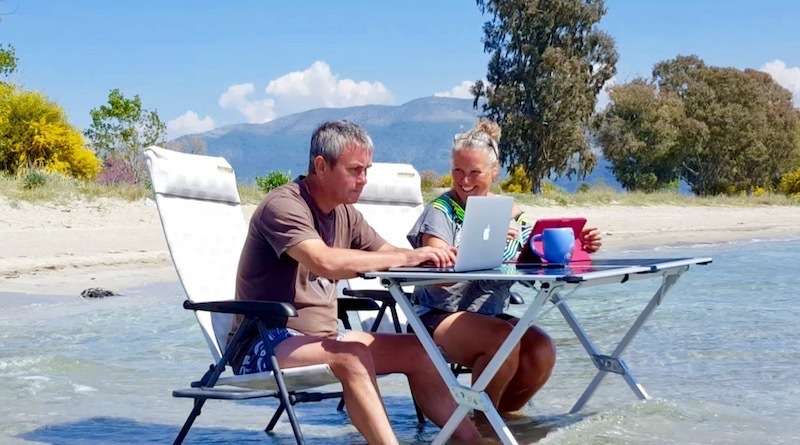 After visiting some of the most amazing coastline on the Peloponnese, followed by a stay on the island of Crete, which is famous for its northerly winds, we started to experience some difficulties with our fly screen. Albeit an intermittent problem, a problem none the less. Now on a day to day basis that doesn’t sound too much of a challenge, except when someone turns up the thermostat and starts to melt you. Open windows and vents just don’t satisfy the insatiable need for heat relief – you got to get that door open. ‘So just open the door’, I hear you scream! Well you could be right, although then there’s that delicate balance between airflow and mosquitos! We value our sleep far too much to risk having the door open without that little netted barrier. So what’s a girl to do? Well you call in the services of your very own DIY Superhero, aka Myles. I had a fancy that our sticky screen was due to the onslaught of salt, brought in on the afternoon Greek winds. Over five weeks that salt had accumulated and built up on the flyscreen fibres and just clogged it up. Well that was my theory anyway. And given that Myles loves fixing things, what better a challenge than to get him to solve our little predicament – and quickly. After a bit of research that brought up no immediate solutions, Myles took off said door and saw no evidence for our sticky issue and so he turned to his old faithful! WD40 – the cure-all juice. No traveller should be without it. So with a bit of a spray in the mechanisms and a bit of a dab on the horizontal guide strings – hey presto it works a treat. I think we probably need a bit of warm soapy water to just finish off the job and make it a smooth operation, although so far, so good. So if you’re ever having problems with your screen, check that there’s no sand in the bottom track and then work the material with either some warm water, or in our case WD40 and see if that makes its movement smoother. Be mindful if you’re camping a lot by the coast that salt will have an impact on your entire vehicle and not just the fly screen. Whilst salt may not be your particular issue, it’s worth checking it out before the costly journey to your dealer. It’s been an interesting lesson for us. Quick update on 10 June, whilst the WD40 certainly helped, it was still causing us some problems. So out came the soapy, warm water and hey presto. Problem is now well and truly resolved. Keep it Simple!